The GAPS diet for a college student! Not only that but my mom and I are putting her on the GAPS diet. Right now we are slowly transitioning her. The past few days she has had no wheat, very little sugar, switched to raw milk, drinking bone broth, probiotic, fish oil, magnesium oil, a few bits of ferments (though she craves kimchi!! ), and increasing veggies. Last night I taught her how to make soup, but by the time we finished she was feeling pretty anxious…I guess she is getting die off. She is doing her own blog about her personal journey http://mysummerdetox.wordpress.com/ My mom and I are playing dr. and she is the patient. She suffers from acne and cramps, so hopefully GAPS will clear some of it up, if not all of it. So here is the recipe we made together..
2. Sauté onions and garlic with salt and butter in big pot until translucent. 3. Wash and chop cauliflower and carrots (rough chop). 6. Add the chicken shreds and let the soup cool down a little so you don’t burn yourself when scooping it in the blender. I use this one. 7. Scoop the soup into the blender, we had to do it in a few batches. 8. Blend until smooth (this is the time to add the raw milk and shredded cheese to give it extra creaminess). 10. Eat..yumm…and store the rest in ball jars in you fridge for later. This was a really lovely soup. I will make it again in the autumn. Great comfort food. Yes, that is when i made it..way to hot for it now. I have to come up with a chilled soup for summer i guess! Do you ever make your soups with your Vitamix? Obviously the stocks wouldn’t work, but something like this would….just wondering. I never see a reference to it on any of the GAPS sites, other than with your avocado pudding. Thanks! Yes! I do use my vitamix for this soup! I just say “blender” because not everyone has a vitamin..but I use it for all my blender recipes. I prefer not to heat the soup with the vitamix because I don’t want the plastic to leach into the food. Caroline, What happened to the chicken shreds? I’m guessing that it refers to cooked chicken and maybe it’s added after blending? It sounds wonderful especially as I love creamy soups. Oh sure, I would grate a tsp of fresh ginger or put 1/2 tsp of dried into it..good idea! Thanks for sharing at the Grateful GAPS Holiday Foods blog hop! I made this last night and it was fabulous!! I wanted a soup that’s filling, low calorie but also satisfied my love of thicker, “cream” soups…this one definitely fit the bill. I was amazed how thick it turned out. I added about half the chicken before blending it (which I did in the pot with my stick blender) and then added the other half as garnish. When possible, I make my own chicken stock and happened to have some in the freezer…the soup was really flavorful and I think the homemade stock made it extra flavorful and yummy!! 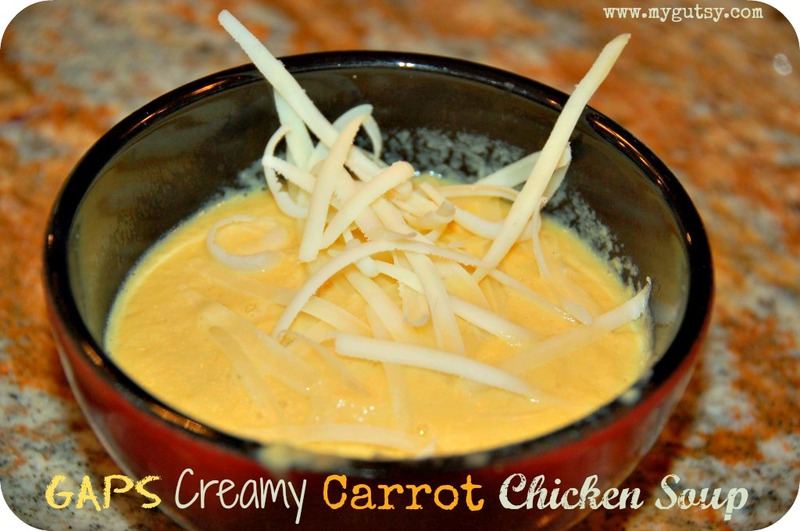 Thanks SO much for sharing this recipe…it’s a real comfort food without all the calories!! I just made this for the first time and I am impressed. I used my immersion blender so that I could just mix it right in the pot and it turned out beautiful and delicious! Half will go in the freezer and this is a keeper! Thanks! In fact, tomorrow I’m going to take the same basic idea, cook up the onion, first cook up a few slices of bacon then add the cauliflower and turnips, chicken broth and coconut milk, cook, blend, then add in some leftover cod and the bacon. We’ll see how it turns out. Thanks again! Amazing recipe! Trying to convert my kids to my way of eating and this soup may be the first step. My 11 year old will not eat veggies… And even he likes it! Thank you! I LOVE this soup. I stumbled upon it on someone’s Facebook post. I’ve made it 3x since then and making it again tonight! So good and is really easy on my digestive tract. I make it without the milk (doesn’t need it). Wonderful recipe. Hi Jackie, yes this soup is soo yummy!! That reminds me I should make its again.